Whilst the city flourishes from the colours of Vivid, The Ternary invites you to indulge in a culinary sensation, Unlit by The Ternary, a dinner by candle light for one night only on Thursday 23rd May, 2019. Indulge in a 6-course degustation menu paired with matching wines, created by Director of Culinary - Anthony Flowers. Picture the entire restaurant, lit only by candles, with views of the Sydney City Skyline, simultaneously lit by the world-famous festival of lights, Vivid. For all enquiries and to book, contact Kiera Staines on E: Kiera.Staines@accor.com OR Phone (02) 9288 7078 // 0498 500 068 Please note: the menu is subject to change. This offer is not valid in conjunction with any other offer or loyalty discount. The Ternary has teamed with Sydney’s own Batch Brewing Company to create a dinner and craft beer experience for one night only on Thursday 20th June, 2019. Enjoy a 6-course degustation menu paired with beers by Batch, known for brewing beer the traditional way, hand crafted and made batch by batch. Please note: the menu is subject to change. This offer is not valid in conjunction with any other offer or loyalty discount. The Ternary together with The Scotch Malt Whisky Society will host a luxury collaborative dining experience for one night only on Thursday 15th August, 2019. Begin an evening of indulgence and exploration with a Whisky cocktail created by The Ternary bar team followed by a 6-course degustation menu paired with rare Scotch Whisky varietals. Finish with a surprise Whisky sample. The pre-eminent leading man of Australian musical theatre, Anthony Warlow, joins forces with the incomparable Gina Riley in this spectacular re-imagined version of the musical thriller SWEENEY TODD: The Demon Barber of Fleet Street. Warlow - Australia’s original Phantom - is set to play ‘demon barber’ Sweeney Todd, while Gina Riley plays pie-shop owner Mrs. Lovett in Stephen Sondheim and Hugh Wheeler’s 1979 musical masterpiece. Together they bring high-wattage star power to this unique new concert production. They will be joined by musical theatre icon Debra Byrne, the incredibly talented Michael Falzon and international opera star, Daniel Sumegi. Check out the full company on the official website. Vivid Sydney 2019 is coming soon and Darling Harbour has a space-age reboot with Light, Music and Ideas to entertain and inspire visitors of all ages and abilities. Activate a brighter future where sentient robots help us regenerate the Earth and make life on other planets of our galaxy possible. With all the usual favourites from past years', this year's Easter show trend is coffee in a cone. A waffle cone coated in chocolate with your choice of coffee. Transport to and from the hotel to Sydney Olympic Park is simple either via taxi or close by train (Town Hall or Central via light rail). The show runs from Friday 12th April - Tuesday 23rd April. Pre purchase (recommended) your tickets here. Book your Novotel accommodation here or ibis here. Book your Novotel accommodation here or ibis here. From intimate portraits to wild landscapes. Internationally-acclaimed exhibition Wildlife Photographer of the Year returns to the museum on 7 March 2019. On loan from the Natural History Museum in London, these 100 extraordinary images celebrate the diversity of the natural world, from intimate animal portraits to astonishing wild landscapes. Wildlife Photographer of the Year is the most prestigious photography event of its kind, running for more than 50 years. It has a pivotal role in providing a global platform to showcase the natural world’s most powerful and challenging imagery. Chosen from more than 50,000 international entries. Winning images are selected for their creativity, originality and technical excellence. Launching in 1965 and attracting 361 entries, the competition today receives almost 50,000 entries from 92 countries. The 100 award-winning images selected embark on an international tour allowing them to be seen by millions of people. The competition was launched in 1965 and now receives over 42,000 entries from 96 countries highlighting its enduring appeal. There are 21 categories for both adults and younger photographers exploring the world’s natural environment. Internationally acclaimed curator Huang Du brings us On Sharks & Humanity - a thought-provoking contemporary art exhibition about shark protection showcasing work from some of China’s leading contemporary artists. The Sydney exhibition will also feature works by Australian Indigenous artists that explore sharks as totems and our relationship to them, alongside photographs and artefacts from leading ocean environmentalist Valerie Taylor, who with her late husband Ron Taylor, transformed themselves from spear fishers to shark protectors. On Sharks & Humanity was conceived by Parkview Arts Action China and launched in Monaco in 2014, and has since travelled to Moscow, Beijing, Hong Kong and Singapore. Good food and good wine is nothing without good company to share it with, and this year the Good Food & Wine Show, presented by Citi, is excited to again offer an exciting line-up of features to discover, taste, share and enjoy. Here is your chance to become immersed in all things food and wine, with returning show favourites and new, never before seen experiences and masterclasses. From an Egyptian mummy to Ned Kelly, uncover the hidden stories of 200 Treasures of the Australian Museum in the Westpac Long Gallery. This magnificently restored gallery showcases 100 objects and 100 people that have influenced the museum, nation and region and reveals the unexpected stories that make them treasures. The Westpac Long Gallery is a new permanent gallery. It is open daily, 9.30am - 5pm and entry is included in your General Admission ticket. See the admission page for more information. The great barrier reef is coming soon to Sea Life Sydney "Day and Night on the reef"
This new interactive experience will take guests on a colourful journey of the world-famous Great Barrier Reef with state of the art technology, a 1.7 million litre display and over 500 creatures. James Cameron – Challenging The Deep is a major new immersive exhibition that traces Cameron’s lifelong pursuit of achievements in deep ocean science, technology and exploration including his record breaking dives in DEEPSEA CHALLENGER, the submersible vessel he designed that was built in Sydney. The James Cameron Vivid Ideas ticket also includes entry to the James Cameron - Challenging the Deep exhibition museum. Queen original band members Brian May and Roger Taylor are teaming up once more with long time front man Adam Lambert on lead vocals and returning to Australia with a brand-new, spectacular production. Completing the tour line-up are long-term collaborator Spike Edney on keyboards, Neil Fairclough on bass, and Tyler Warren on percussion. Enjoy Happy Hour at The Ternary Bar from Sunday - Thursday, between 4 and 6 pm and make the most of our $6 drinks. Shark Dive Extreme is an exhilarating experience and one of only a few experiences worldwide where you’ll be guaranteed an underwater encounter with sharks. With no previous diving experience required, SDX will make a daring diver out of anyone* Come face to face with sea turtles, massive stingrays, Port Jackson Sharks, Wobbegong Sharks and hundreds of other amazing sea creatures! Underwater photos and video footage are also available for purchase at an additional cost. Would you dare take up the challenge and live to tell the tale? Human Nature are making a triumphant return home in 2019 to celebrate an amazing 30 years of music. The Little More Love: A 30-Year Celebration Tour will be the biggest live show ever produced by Human Nature and will head to the Gold Coast, Brisbane, Adelaide, Melbourne, Perth, Canberra, Sydney and Newcastle. Fresh from their smash hit Las Vegas headlining residency – where they have performed in excess of a staggering 1,770 shows – Human Nature’s Toby Allen, Phil Burton, and brothers Andrew and Michael Tierney, will perform hits from their 13th studio album, Romance of the Jukebox including their original track 'Little More Love', alongside career hits like 'Tellin' Everybody', 'Last To Know' and 'Dancing In The Street'. Human Nature will be joined by musician and superstar Dami Im as a special guest on all shows. Novotel Sydney on Darling Harbour are the proud owners of two bee hives which will provide honey for our guests as well as serving to pollenate nearby plants in the region. Joshua Bounday, our assistant front office manager, was largely responsible for realising the vision of getting bee hives at the Hotel, with his extensive background and knowledge as an apiarist lending his services to ensure that this dream realised. Housing and harvesting honey from beehives is part of AccorHotels Planet 21, an initiative where a compromise is struck between providing travellers a comfortable and convenient stay whilst implementing methods and processes to reduce our carbon footprint and movement towards a sustainable and responsible company such as low flow toilets, eco-designed beds, eco-certified soaps and cleaning products, sustainable foods with an emphasis on locally grown produce and a greater commitment to recycling. It is anticipated that future harvests will provide enough honey to use as guest amenities with surplus honey to be used in The Ternary restaurant as an inclusion in the buffet breakfast. The piece was commissioned by the Hotel in acknowledgement of our local Gadigal community as the original custodians of the land upon which the Hotel sits. We thank Jacob for sharing his talent and welcome all to come view the piece in the Hotel. “The Gathering Place” aims to capture the journey taken by many across the numerous oceans and seas of the world. A journey which leads them to this land, traditional Gadigal land of Sydney where the hotel sits. The centre piece portrays the area of the Novotel and Sydney Harbour, and the places of origin spread across the canvas symbolised through the traditional circular symbols. Ultimately The Gathering Place has the goal of detailing the significance of travel and the beautiful land in which the Novotel thrives amongst. 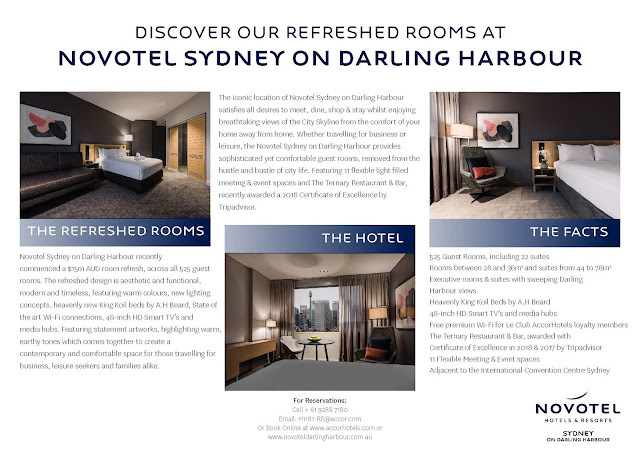 Novotel Sydney on Darling Harbour Completes $15 million room refresh paying homage to the Hotel's Iconic Harbour Location. Novotel Sydney on Darling Harbour has recently completed a $15-million-dollar room refresh across each of the hotel’s 525 guest rooms. Offering five room types from the Superior Rooms to the Executive Loft Suites the spacious rooms feature beautiful views of Darling Harbour and the Sydney City Skyline, providing ample opportunity to take advantage of the stunning iconic location. The refreshed design is aesthetic and functional, modern and timeless, featuring warm colours, new lighting concepts, heavenly new King Koil beds by A.H.Beard, state of the art Wi-Fi connections, 48-inch HD smart TV’s and media hubs including comfortable working and dining areas. Featuring statement artworks, plush soft furnishings spotlighting warm earthy tones which come together to create a contemporary and comfortable space for those travelling for business, leisure seekers and families alike. Every Novotel is a destination in itself and Novotel Sydney on Darling Harbour is no exception, offering something for everyone. Whether visiting solo or as a family, guests are free to explore all that is on offer within the 4.5-star hotel. Featuring an outdoor pool, In-Balance gym, tennis court and The Ternary; a concept restaurant and bar that brings an air of casual sophistication allowing guests to experience three distinct offerings; The Grill Kitchen, The Asian Kitchen and the Wine Bar - in a single, stylish open space offering spectacular floor‐to‐ceiling views of the city skyline. The Ternary is the perfect location for any occasion, in the restaurant the menu celebrates top quality, locally-sourced produce with the bar featuring local and international pours, in addition to their mouth-watering cocktails created by The Ternary's talented mixologists. Whether it be an intimate dinner with friends, a corporate luncheon or an extravagant soiree, The Ternary’s celebrated service and award-winning catering offers an unparalleled experience with packages tailored to individual needs across a multitude of settings. Novotel Sydney on Darling Harbour is situated at 100 Murray Street, Pyrmont, NSW. Located within walking distance to many of Sydney’s best attractions, including the International Convention Centre Sydney (ICC), Australian National Maritime Museum, Sea Life Sydney Aquarium, Wild Life Sydney Zoo, the Powerhouse Museum and Star Casino. The hotel is easily accessible by public transport, including light rail (nearest station is Convention), ferry (nearest stop is Pyrmont Bay Wharf) and train is only a 10-minute walk from Central and Town Hall stations. The mission to protect and defend the world's oceans has become far more complex and challenging in recent years, and naval aviation has become increasingly vital to success. One of the greatest engineering feats in the history of warfare, the modern Nimitz-class carrier is a masterpiece of technology, and the flagship of the fleet. With RIMPAC, the world’s largest and most comprehensive international maritime training exercise providing a stunning visual context for the story, find yourself aboard the USS Ronald Reagan alongside the 5,000 highly skilled sea and air personnel conducting flight operations in the midst of the simulated war exercises taking place there. and finally cruise the California coast near heavily-populated Los Angeles. yes of people whose lives have become inextricably linked to the Great White. Narrated by Bill Nighy. At approximately 25 minutes, the film is the perfect length for an air-conditioned break after walking around the Maritime Museum. Parental supervision for younger viewers advised. Brand Ambassador and face of InBalance by Novotel Hotels & Resorts, pro surfer Sally Fitzgibbons will make it easy for guests to stay on track with their health and fitness goals while travelling with her new in-room fitness channel, healthy travel tips and nutritious meals. The Penguin Expedition is an immersive experience allowing you to get up close and personal to a spectacular colony of King and Gentoo penguins during a sensory and educational sub-Antarctic boat journey! A world first-of-its kind penguin exhibit where guests can get up close and personal to a spectacular colony of King and Gentoo Penguins at SEA LIFE Sydney Aquarium. A continuous chain of boats, each with a capacity of 8 guests, running all day every day carries guests on a journey along the river, through the heart of the colony. Inspired by Macquarie Island – an Australian owned island that lies in the south-west Pacific Ocean – Penguin Expedition creates an explorer out of each and every guest as they travel in a raft through a rugged sub-Antarctic environment at a cool-but-comfortable six degrees Celsius. The voyage includes getting face-to-flipper in an awe-inspiring recreation of the penguins’ home, including magical flurries of snow, whistling winds and the stunning southern lights. This amazing new discovery aims to educate guests by highlighting the impacts of plastic pollution and habitat destruction affecting these majestic birds. Amazing discoveries await after disembarking thanks to the researchers at the Macquarie Island Explorer Hut. Guests will find out about SEA LIFE Sydney Aquarium’s penguin breeding program and what they can do to help conserve Macquarie Island.